Windows isn’t secure as you might have known. You’ve probably faced threats and trojans on your computer. There are loads of programs that are targeted at keeping your Windows computer safe from intrusions, here’s a pick of the best of them. If you’re asking ‘Why list tens of software that does pretty much the same job?’ – well, each one is a bit different and comes with unique and better features than the other one. I’m not advising you to install everything listed here, just browse around and find the best that suit your needs. Avast! Free Home Edition – The best free antivirus software available in the market IMHO. The detection engine is very good, and there’s on access protection and real time scanning of Web Traffic – so you’re very safe when browsing. AVG Free – The second best, neat interface. Lightweight. Just go for it if you’re running Windows on older hardware. You won’t regret your choice. ClamAV – Open Source, the perfect antivirus tool to carry around in your portable USB disks. Command Line Scanner included. Spybot Search And Destroy – The best in this arena. Frequent updates to keep you protected. Ad Aware Free Edition – Worth keeping along with Spybot. I’ve found Ad Aware catching a lot of stuff that Spybot sometimes misses. Spyware Terminator – Equally good, slick interface and works like a firewall as well – you can disable unauthorized processes. Comodo Pro Firewall – The best free Firewall program out there. Fantastic interface and really a wonderful tool that protects your computer. ZoneAlarm Free Firewall – Quite Popular and widely used. 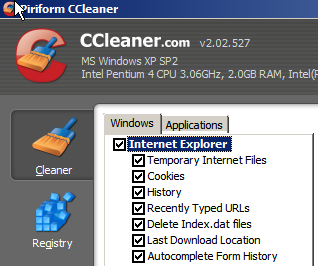 CCleaner – Awesome tool that you MUST have installed on your Windows computer. It’s a junk remover + registry cleaner + uninstaller. HijackThis – Lists all kinds of threats, but targeted at Geeks. It’s possible to remove a spyware easily with this tool – if you know what you’re doing. Else, you’ll be in trouble. WinPatrol – There’s a free version available, and this is one great program that monitors activity (startup program changes, cookies, hidden files, services) on your computer sitting on the tray. Keylogger Detector included. Either use them or switch to Linux 🙂 . I’ve seen nearly all of those anti-spyware tools before, but the free cleaner tools are entirely new to me. Glad your list includes those apps. I plan to pass those around to friends and family. @Bret: Thanks, glad you found the tools useful. Password manager anyone? 🙂 They now come in two flavors – classic, and online. Avast, Spybot SD and Zone Alarm rocks. I’ve used them for 2 years now. No headaches whatsoever. The thing about Linux is that it’s a headache trying to get a multifunction printer/scanner to work! Please try to remember that there are many other distributions of Linux other than Ubuntu. I’m a personal fan of sabayonLinux myself. Linux is great if you have no peripherals. I use high end video cards and sound cards and haven’t found any drivers etc… and learning to use new operating system after almost 20 years of using Windows isn’t gonna happen to people running business and families. You kids have time for all that- I’m too busy trying to earn a living. Zone Alarm and Avast good combo- -spyware terminator -didn’t care for it- and Comodo- never seemed like it did a darned thing. – Glary utilities: this is the best system cleaner and optimizer that I ever tried. Spybot is my favourite program of these programs!